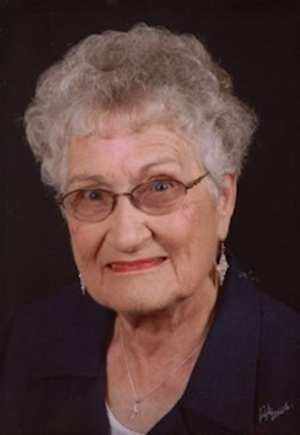 Obituary – Voss, Audrey Mabel (Stephens) « Perry High School Alumni Association, Inc.
Audrey Mabel Voss was born November 5, 1927 in Perry, Oklahoma to Lloyd and Mabel Swisher Stephens. She passed away Tuesday, October 14, 2014 at Perry Memorial Hospital surrounded by her family. Funeral arrangements are under the care of BrownDugger Funeral Home in Perry, Oklahoma. Audrey married Will Art Voss on August 10, 1947 in Perry Oklahoma and to this union four sons were born Dennis, Daryl, Ralph and Russell. Audrey was a member of the Christ Lutheran Church and the LWML. She was a community volunteer, a member of the FFA Mothers Club, and the Black Bear Homemakers. She was a volunteer for the Noble County Election Board, Noble County Fair Board and part time for the Noble County Extension office. Audrey enjoyed sewing, knitting, cooking, crosswords and she was an avid reader. But most of all, Audrey loved her family. Funeral services will be 2 pm, Friday, October 17, 2014 at the Christ Lutheran Church in Perry, Oklahoma with Reverend William Metz officiating. Interment will follow in Grace Hill Cemetery in Perry, Oklahoma. Memorials may be made to the Oklahoma Medical Research Foundation or Christ Lutheran Church, in care of BrownDugger Funeral Home, 1010 N. 7th, Perry, Oklahoma, 73077.